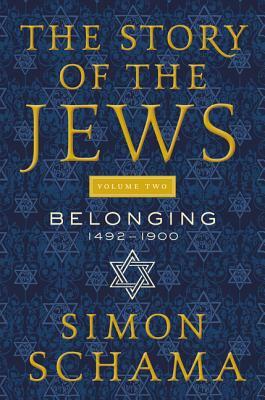 Simon Schama’s great project continues and the Jewish story is woven into the fabric of humanity. Their search for a home where a distinctive religion and culture could be nourished without being marginalized suddenly takes on startling resonance in our own epoch of homelessness, wanderings, persecutions, and anxious arrivals. Volume 2 of The Story of the Jews epic tells the stories of many who seldom figure in Jewish histories: not just the rabbis and the philosophers but a poetess in the ghetto of Venice; a general in Ming China; a boxer in Georgian England, a Bible showman in Amsterdam; a teacher of the deaf in eighteenth-century France, an opera composer in nineteenth-century Germany. The story unfolds in Kerala and Mantua, the starlit hills of Galilee, the rivers of Colombia, the kitchens of Istanbul, the taverns of Ukraine and the mining camps of California. It sails in caravels, rides the stagecoaches and the railways, trudges the dawn streets of London with a pack load of old clothes, hobbles along with the remnant of Napoleon’s ruined army. Through Schama’s passionate and intelligent telling, a story emerges of the Jewish people that feels as if it is the story of everyone, of humanity packed with detail, this second chronicle in an epic tale will shed new light on a crucial period of history. Simon Schama is University Professor of Art History and History at Columbia University in New York. His award-winning books include Scribble, Scribble, Scribble; The American Future: A History; National Book Critics Circle Award winner Rough Crossings; The Power of Art; The Embarrassment of Riches: An Interpretation of Dutch Culture in the Golden Age; Citizens: A Chronicle of the French Revolution; Dead Certainties (Unwarranted Speculations); Landscape and Memory; Rembrandt's Eyes; and the History of Britain trilogy. He has written and presented forty television documentary films for the BBC, PBS, and The History Channel, including the Emmy-winning Power of Art, on subjects that range from John Donne to Tolstoy.